Largepoint.com is a webshop that offers articles especially for surfers, bikers and mountaineers - easy for everyone who likes to be in nature. As the official importer of the GPS tracker BGT-31 and GT-31 from the Locosys manufacturer, we specialize in these devices. The GPS tracker was originally designed for Speedsurfer because they are very accurate due to the Doppler measurement. This precise recording of distances and speeds makes the device also interesting for other sports. Due to the extremely long recharge time, even hikers who are traveling for days can record complete hikes. So the next logical step was to offer items for hikers, mountaineers and other athletes. Qualitatively highest quality we found the products of the manufacturer Aquapac. The most famous waterproof bag is the Aquapac PRO Sports. The small brother is the Aquapac PRO Sports Mini Protector. Even if you "simply" do beach holidays, the waterproof cases are very handy. You can safely store your mobile phone, hotel key or small money. But most of all, we have devoted ourselves to surfing. More about surfing, especially speed surfing, can be found on the page of our partner, the association Deutscher Speedsurfer e.V. The aim of this association is to provide a common platform for surfers and surfers who have a passion for speed-surfing, thereby developing and promoting a community. We have set up our own category for surfing caribbean style. 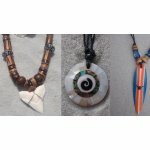 These handmade jewelry we will ship even free shipping. 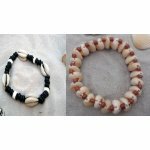 These pendants, necklaces and bracelets are made of natural materials such as mussels, groins, coconut slices, fish bones, bones, etc. We are also represented on Facebook - simply click on "like me" and have always informed you about new products and current special events.